1. I always appreciate it when people respond to my emails. On a whim, I emailed the realtor in charge of the Belle Sherman Cottages to see which ones were underway with sales, and what the time frame was. 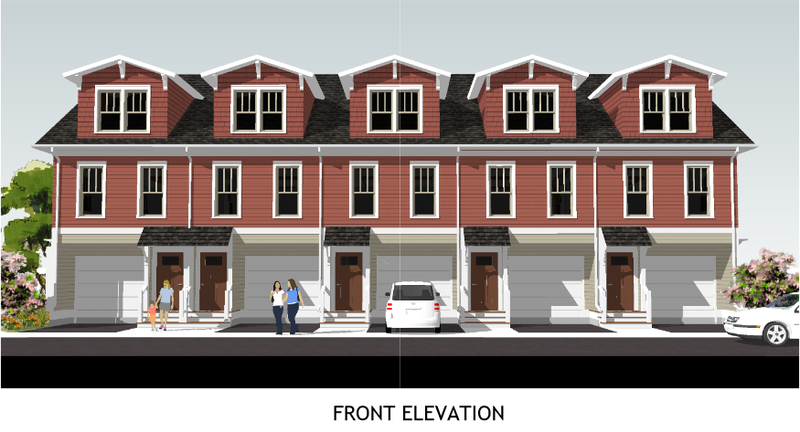 She forwarded the request to the developer, Toby Millman of Agora Homes and Development LLC, who wrote back to say that as of the 17th, the front-loading garages on lots 25-29 (render above) were being marketed, and three of the five have been sold. They are planning for an April 2015 completion for those five, with the modules being set into place next year (some site prep work may occur this fall). The five townhomes with the back-loading garages are not being marketed just yet. Who knows, with most of the homes being sold and several under construction, the entire project could be complete by the end of 2015. 2. Oh geez. An Irish-themed Hooters is coming to Ithaca. According to the Post-Standard, Tilted Kilt, a “Celtic-themed sports pub”, is looking at a restaurant for Ithaca. The Syracuse location due to open next month will be 7,000 sq ft, I expect an Ithaca location would be similarly-sized. The chain already has a location in Watertown, and has plans for a Utica restaurant as well. Basically, any city over 30,000 roughly within an hour’s radius of Syracuse. Here’s the chain’s website, featuring a woman preparing to make out with a hamburger. I’m sure the fratty frat boys at Cornell are getting excited. Placing bets on whether they go for Lansing or southwest Ithaca. 3. Per the IJ, The developers of the Carey Building expansion are asking for a tax abatement from the city via the CIITAP application. 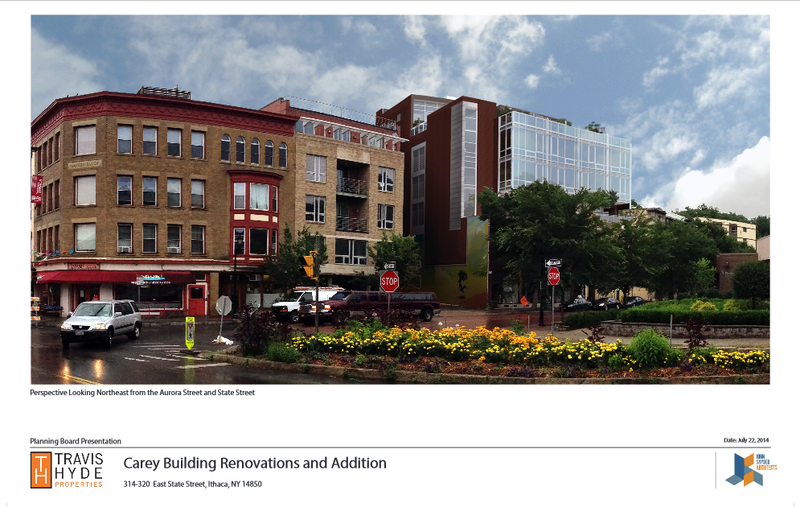 A primer on CIITAP applications can be found here at the Ithaca Voice; a number of projects in the city’s “density district” have used them in recent years as a way to offset high development costs in downtown and West End. 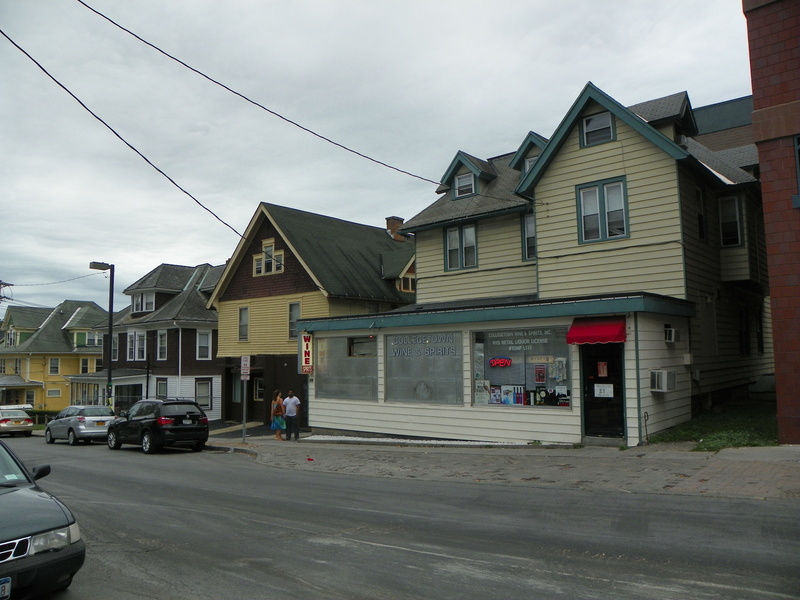 Recently, Jason Fane made news for pursuing a tax abatement via CIITAP for his project on East Clinton Street. The standard abatement is 7 years, with 90% of the increased value being offset in the first year. In this case,the building was assessed in 2014 at $475,000. 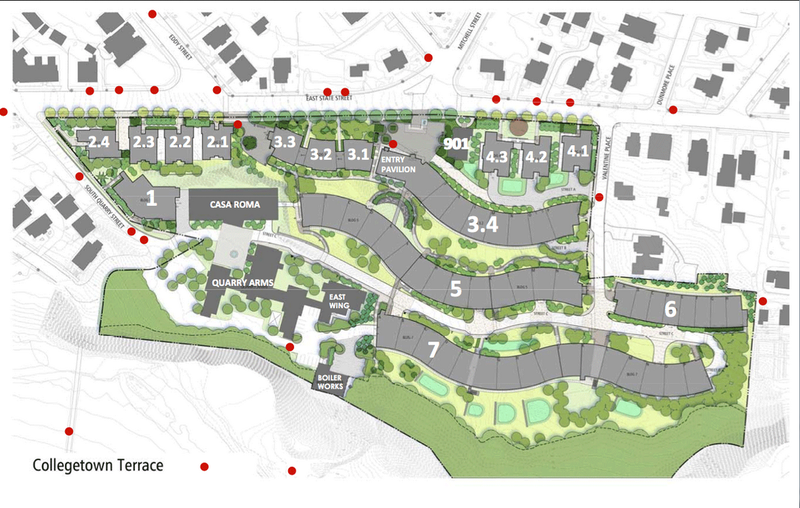 The new construction will cost $4.7 million according to the IJ, but it says $1.6 million in the city’s site plan application; that gives us assessed values in year one of $945,000 if the IJ is right, or $635,000 if the SPR is still accurate. The abatement tapers off through the latter six years. As with Fane, I suspect Travis Hyde Companies is pursuing an abatement simply because they can, they meet the qualifications so carpe diem. The wide difference in the IJ and SPR numbers could be an indication of rapidly rising project costs. Regardless of reasoning, this definitely isn’t going to do the developers any favors when it comes to community relations. 4. Maybe the Novarr interview in the Voice will have run by the time this runs; maybe it won’t. Just in case, straight from the developer himself, Phase III/Building 7, with its 247 units, is planned for a late 2015 construction start, with completion in the summer of 2017. It’s a long construction period; it’s also a very big building. 5. 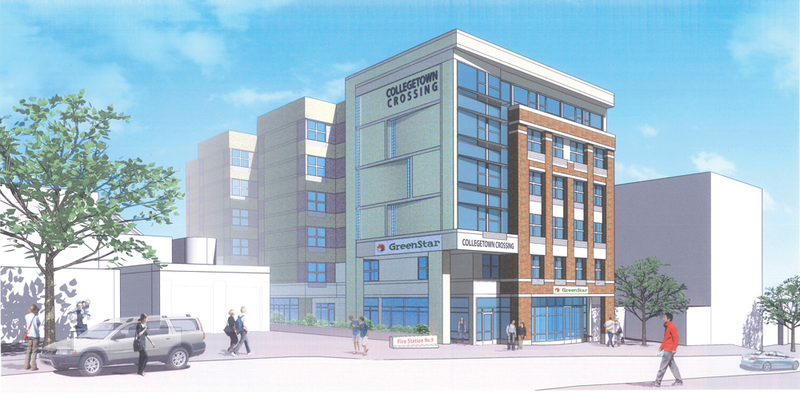 From the Cornell Daily Sun, it’s expected that rents at Collegetown Crossing will be around $1,000, per month, per tenant. Students in Cornell’s Student Assembly aren’t exactly pleased, since that number far exceeds even what most Cornellians can afford (but don’t worry; with student population growth far outstripping supply, there’s enough demand for student rentals, even in the luxury segment, that this place will fill up to capacity as soon as it opens). Welcome to Ithaca’s severely under-supplied rental market; open your wallets wide, boys and girls. It just occurred to me that since I wrote the enrollment column last year with 2012 numbers, I glanced at the 2014 numbers on the University Factbook. Now it’s 21,850, an increase of 426 students in 2 years, and in pace with the 2002-2012 period. 234 of that 426, 55%, were grad and professional students. 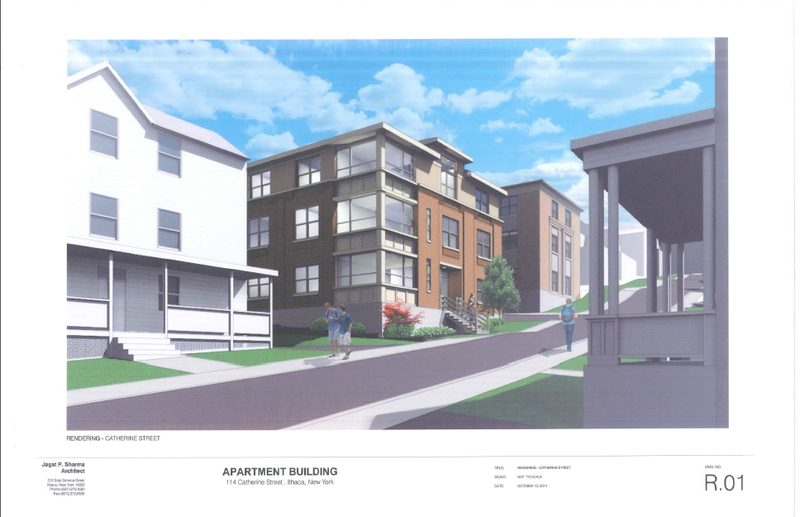 There are a number of factors for why it’s so expensive – land values in Collegetown are high, construction labor is expensive because Ithaca is off the beaten path, taxes are high, and the new Collegetown zoning doesn’t allow Lower to build out the rear portion as he initially intended, forcing him to keep the building’s rear flank at 4 floors instead of 6 (the zoning is also what allows him to build in the first place, since it removed the parking requirement). Let me be clear. Unless something is done to reduce demand or increase supply, this will become the norm, and Cornell students of modest means will be placed in an increasingly precarious situation with the cost of housing. Just like the rest of Ithaca. 6. To wrap things up, here’s looking into the agenda of next week’s Planning Board meeting (and what will probably comprise my mid-week posts). Purity, The Canopy by Hilton, Chain Works, 114 Catherine, and the 15,700 sq ft retail building on the Wegmans pad site. Only the Wegmans parcel is up for final approval. 114 Catherine comes to the board with one major change – the front entrance was moved from the corner to the middle of the front facade. Still 17 bedrooms in 3 units. As for new projects coming up for sketch plan, we technically have three. As much as I was looking forward to it, Ithaca Gun is not one of them, but I’ll keep my fingers crossed for next month. The first is 402 S. Cayuga Street. 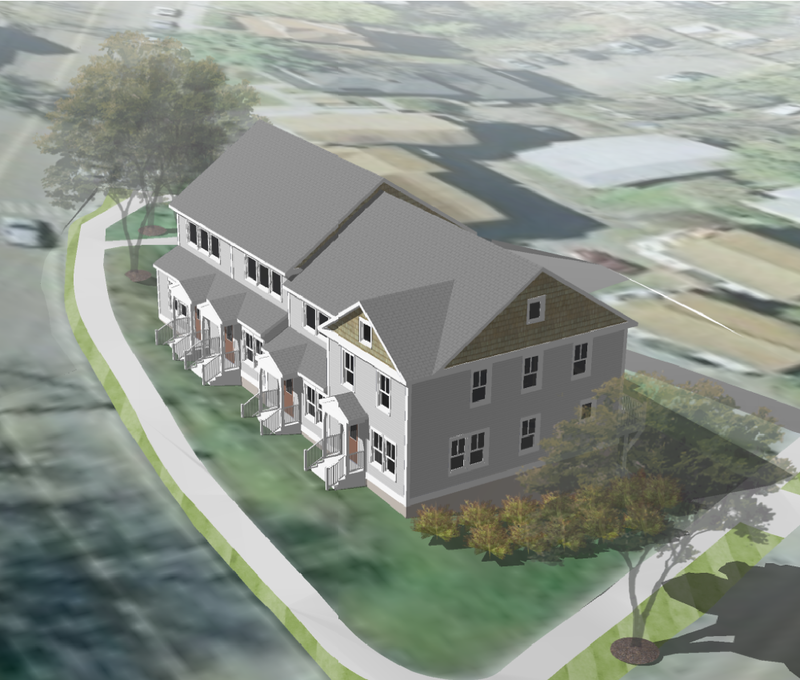 Eagle-eyed readers will recognize this as INHS’s 4-unit townhome project. 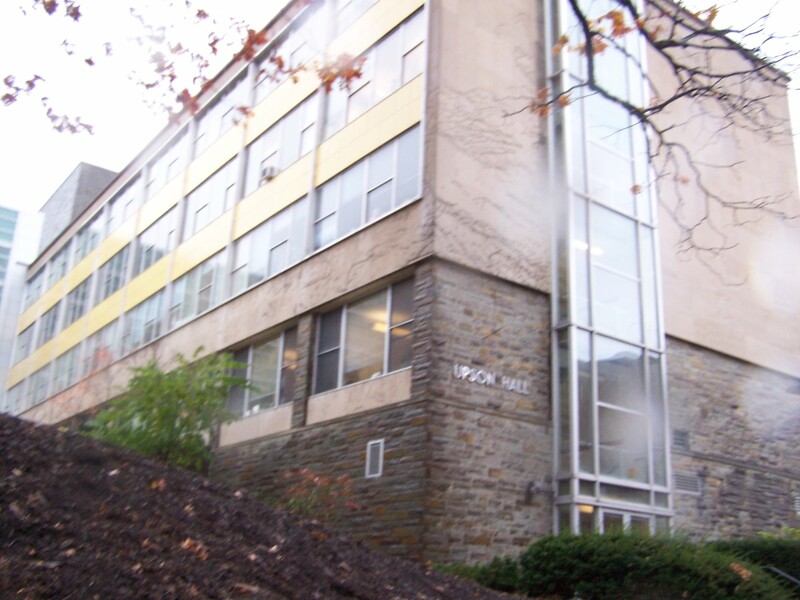 The second is Cornell – Upson Hall renovations. Cornell stuff is easy enough to find, they publish veritable novels about projects once they’re cleared by the Board of Trustees. Upson renovations sound like they’re mostly internal work with a facade update. I’m more interested in the proposed biomedical building they have yet to roll out designs for. The Upson renovation is supposed to cost $63 million, so maybe there are additions involved; the new biomedical building, $55 million. The firms involved look to be LTL Architects, Perkins+Will, and Thornton-Tomasetti. In other words, modern glass and steel box, looking for LEED Gold. No renders yet, but I’ll post ’em when I see ’em. The last of the trio is yet another Collegetown project – 302-306 College Avenue, an address which consists of the three architectural stunners above. I’ve been patiently waiting for a proposal here (though to be honest, I’m kinda partial to 302, second from the left). John Schroeder from the Planning Board has wanted a proposal here for years. They sit in an MU-2 zone – 6 floors, 80′, no parking required. All three are owned by the Avramis family, Collegetown’s third-largest property owners. More interestingly, rumor has it that the buildings they own contingent to 302 College on Catherine Street, which are CR-4 zoning (no parking, 4 floors), are involved as well. So this could be a fairly substantial project. My money is on Sharma Arch being involved, since they are Avramis Real Estate’s usual architect-of-choice. I figured that the M&T Bank on the 400 block would get torn down first, but this is no big surprise, the Avramises have been fairly active in redeveloping their properties. In defense of the TK, it’s a nicer styled place than Hooters. TK would be the Five Guys Burgers vs. a Hooters-McDonalds (same idea, but much less shame). TK would actually work quite well next to the golf course, with a patio. Attract some life, pump some blood into the Ithaca Muni Course, they both cater to roughly the same client base: guys who like sports.